Those Affected By Trump's Travel Ban Hope For End To 'Chaos' After Supreme Court Case : Parallels "The executive order, at its heart, says Yemeni people are bad and they need to stay away. We say no! We are part of the fabric of the country," says a Yemeni-American whose mother was denied a visa. Yemeni-American Fathi Alhuthaifi stands with his son Ahmed, 9. His wife has been denied a visa under the Trump administration's travel ban. 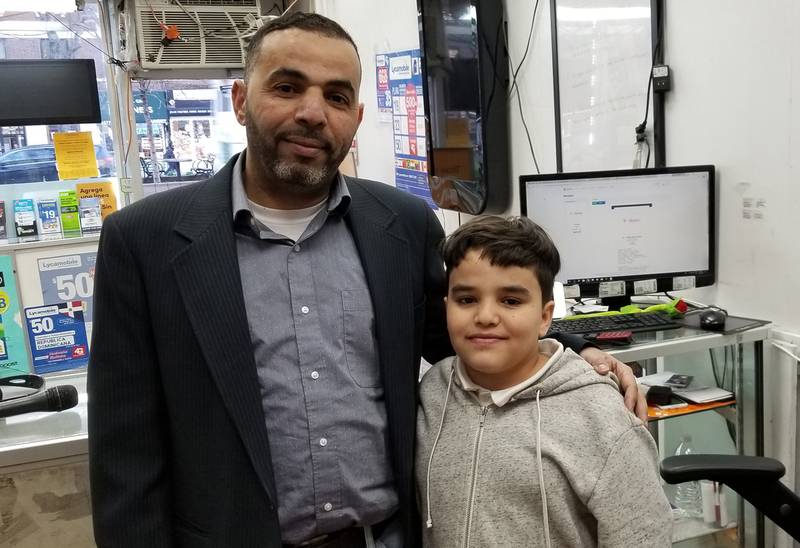 At the New York City cellphone shop where he does his homework, 9-year-old Ahmed Alhuthaifi says he misses his mom a lot. "Sometimes, I feel like I am going to cry," he says. "Trump won't let her in." After a years-long effort, his mother, who is stuck in Saudi Arabia, was denied a visa because of President Trump's restrictions on immigration and travel from certain countries, including Yemen. She and Ahmed's four younger siblings, who live with her, missed Ahmed's birthday celebrations on April 3. "He expected them to be here, all his brothers and sisters; he's depressed all the time," says Fathi Alhuthaifi, his father. "I need my wife and kids. We are in a bad situation." On Wednesday, the Supreme Court will hear oral arguments in a case challenging the ban as discriminatory and unconstitutional. Administration lawyers insist the ban, in effect in full since early December, is a national security necessity. Alhuthaifi is an American citizen. He emigrated from Yemen more than 20 years ago and runs a successful cellphone business on West 145th Street in Harlem. He named his youngest son McCain, after the Arizona Republican senator he admires. "As soon as you step your feet in this country, you feel you are part of the country," he says. But the administration's travel ban has dashed his dream of uniting his family in New York. All his kids have U.S. passports, but the younger ones, he explains, can't be without their mother, who is not a U.S. citizen. "We thought we were very lucky. It's a dream country. But the time has changed," he says. Whatever the outcome in the Supreme Court, the Trump ban has already sown chaos in affected families across the country, says Muna Jondy, a Michigan immigration lawyer of Syrian descent who counsels families in the U.S. whose relatives are now barred from joining them. "My clients are freaking out," she says. "This causes chaos with work visas, student visas, bringing families here." Zaid Alnagi with New York City's Yemeni-American Merchants Association delivers posters for the association's protest on Tuesday. The Yemeni-American Merchants Association of New York mounted a one-hour protest Tuesday, the day before the Supreme Court hearing. 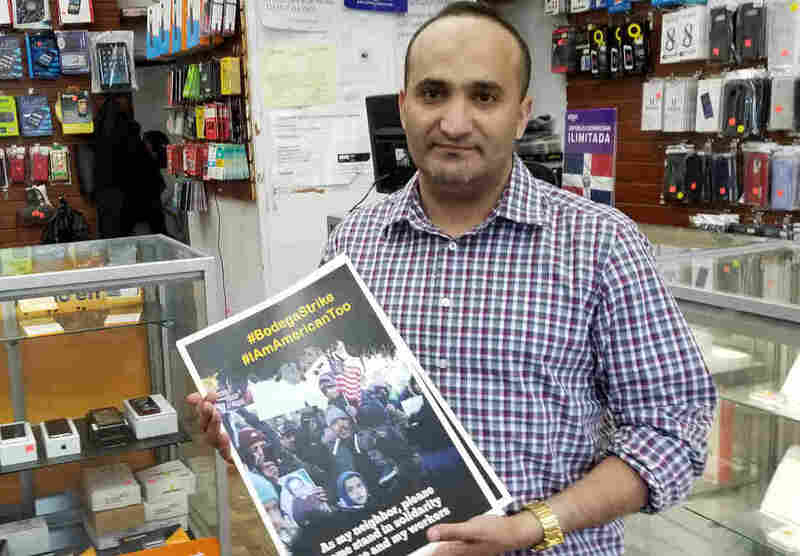 Zaid Alnagi, the association's vice president, distributed posters across the city and created hashtags for a social media campaign, #IamAmericanToo and #BodegaStrike. "The executive order, at its heart, says Yemeni people are bad and they need to stay away. We say no! We are part of the fabric of the country," says Alnagi, an American citizen who has not been able to bring his mother to New York. Her visa was denied this year. President Trump's campaign pledge for a "total and complete shutdown of Muslims entering the United States" is at the center of the Supreme Court debate. The president's executive orders did not cite religion but rather security concerns that motivated his ban. "It's not a Muslim ban and it never has been — the whole Muslim ban narrative is little better than a hoax," says Mark Krikorian, executive director of the conservative Center for Immigration Studies and a White House adviser on immigration. He supports stricter limits on the current immigration system. "The travel ban targets specific, terrorism-infected countries and, as a practical matter, would apply to a relatively small share of the world's Muslims," he says. Critics of the ban, including a judge in Hawaii who ruled against the ban, charge that the biggest burden is felt in the Muslim-majority nations on the list. "No national from any of the countries impacted is responsible for a death from terrorists on U.S. soil since 1975," says Joshua Geltzer, one of 52 former national security officials who submitted an amicus brief to the Supreme Court declaring that the Trump administration has failed to show how the travel ban bolsters national security. He argues that the countries subjected to the ban "don't seem to have any resemblance to where terrorism threats are emanating from." "The thing that is frustrating is it's stereotyping," says Dr. Ziad Alnabki, a Syrian-American cardiologist in Jacksonville, Fla. "We can't just label all of them terrorists and close the door for them coming in." Alnabki first came to the U.S. more than a decade ago for his medical residency in Tennessee, after graduating first in his class from Damascus University. After Syria descended into a brutal civil war, Alnabki applied for immigrant visas for his parents. After years of waiting, they finally got an interview this year at the U.S. Embassy in Cairo. "We were shocked when their application was denied at the beginning of the year. The travel ban came along and we couldn't get them here," he says. "I love my job; it's the most rewarding thing in my life," says Alnabki, who works in a cardiac unit. "I take care of patients, and the son or the daughter gives me a hug. But at the same time, I can't have my parents next to me here so I can see them and they can see my kids." While the ban allows for case-by-case waivers, those waivers are rare. According to Reuters, about 100 waivers were granted between December and early March. More than 8,000 had applied for U.S. visas in that period from countries affected by the ban. The letter informing Alnabki that his parents would not be granted visas also said they were not eligible for a waiver. "It's totally arbitrary," says Jondy, the Michigan-based immigration lawyer, who handled Alnabki's case. "One client who is a doctor, his parents are stranded in Cairo; but another family in Damascus did get a waiver. They are Christians," she says. She says the few cases she has handled don't show a pattern yet, but she advises her clients who are Christian to include their religious affiliation in the application. She says those who do so have been granted waivers. "I am doing things like putting in a baptismal certificate," she says. "That is not normally the evidence that you submit in a waiver application, but it has worked." Jondy says she fields hundreds of panicked calls and text messages from clients who plead for help. The stress, says this second-generation immigrant and American citizen, has been overwhelming for all concerned. "You just can't have an arbitrary policy that's based on discrimination against Muslims," she says, which is her view of the travel ban. "It's just basically, 'We don't want them here and so let's find a way to get them not to come here.' "